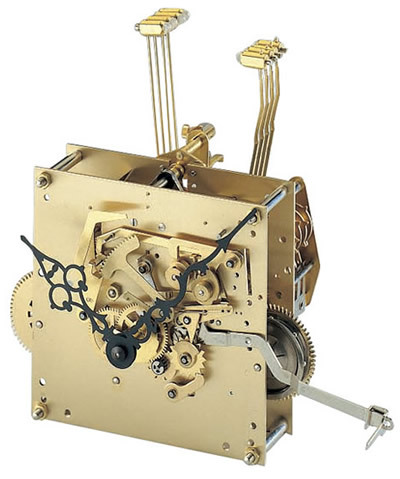 Movement: Kieninger RWS 13 - 116cm. Pulleys: Single brass yoke pulley included. Mounting: Brass SATIN finish movement support bracket. .
We can supply this set with one longer weight shell on a single pulley or a pair of weights on a single yoke pulley. 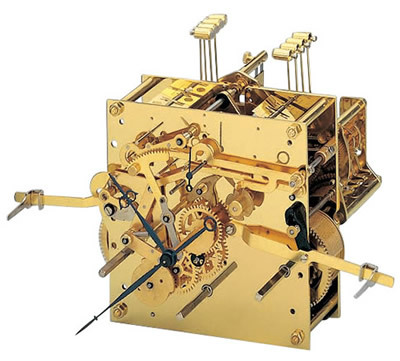 The RWS 13, 116cm movement requires a clock cabinet with a minimum depth of 135mm measured from the inside face of the dial glass to the rear panel; the weights need to be able to drop a minimum distance of 1210mm, measured between the centre of the dial and the inside bottom of the cabinet. The distance from the rear panel to the front face of the weight is approximately 125mm. 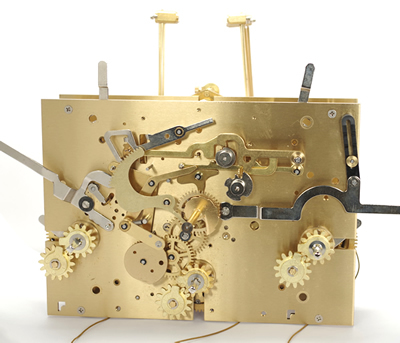 Click here to view the Set 46 Movement Dials and Pendulums images page. Click here to view the Set 46 Options and Prices page. Pendulum length 116cm Cable & Weight Drive. Maintaining Power. Pulleys: Three polished brass pulleys included. Weight Shells: Polished brass weight shell complete, 50 x 180mm. Shell Fillings: Strike 3.4kg, Time 3.4kg (4.5kg for heavy pendulums), Chime 3.4kg. Mounting: Brass SATIN finish bracket. . The RS005 movement specifications. Plate size 131mm x 131mm x 2.0mm. A Dead-beat Graham escapement, Power Reserve, Automatic tick (beat) adjustment. Automatic night silencing - a lever allows you to select Automatic Night Silencing (10PM until 7-15AM), Continuous Chiming or Silent. The RS005 movement chimes the hours and plays the Westminster melody on the quarters, on an 8-rod gong. The Dial, Hands and Movement can be supplied assembled and fixed to a brass support bracket - drill seven holes in the rear board using the template we provide and the movement set & chimes can be easily mounted to the back board of your clock using the special bolts we include in the set. The RS005 116cm movement requires a distance of 1070mm from the centre of the dial to the centre of the pendulum bob, a minimum case width of 285mm to accommodate a 200mm bob and a depth of 135mm measured from the inside face of the dial glass to the rear panel; the weights need to be able to drop a minimum distance of 1210mm, measured between the centre of the dial and the inside bottom of the cabinet. The distance from the rear panel to the front face of the weight is approximately 110mm. 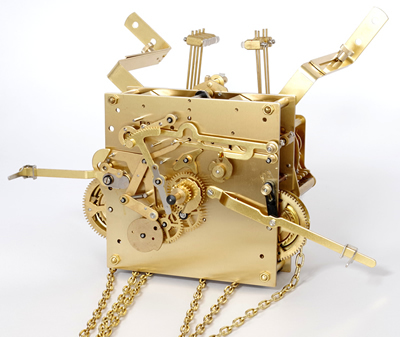 Click here to view the Set 47 Movement Dials and Pendulums images page. Click here to view the Set 47 Options and Prices page. Pendulum length 116cm Cable & single Weight Drive. Special Price Offer while limited stock remains. Pendulum: Oakside 116cm Carbon fibre pendulum with a polished brass cylindrical bob and fine adjustment. Pulleys: Single brass pulley included. Weight Shells: One polished brass shell and pulley included. Gongs: Top mounted polished brass bell. Please note that this movement is delivered with the dial and hands already attached. The TS movement specifications. Plate size 190mm x 84mm x 2.0mm. Cable stick movement with passing strike on the hour, automatic beat adjustment and seconds indication. The Dial, Hands and Movement are supplied assembled ready for fixing to your seat board. I suggest that a clear Perspex seat board would look very pleaseing with this movement assembly. The cabinet for the TS 116cm movement will need to have minimum internal dimensions of 1300 mm high, 180mm wide and 150 mm in depth. 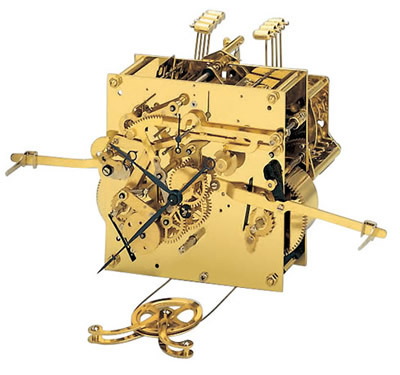 Click here to view the Set 48 Movement Dials and Pendulums images page. Click here to view the Set 48 Options and Prices page.